The German town of Hamich, located in the infamous Hürtgen Forest, was to become one of the bloodiest engagements fought by the 16th Infantry Regiment. The town was a crucial objective in the often overlooked Hürtgen campaign as it allowed the German strongpoint of Hill 232 to be outflanked and taken, weakening the overall strength of the German defence. The plan of attack was relatively straightforward. The First Battalion was to jump off and clear the forest leading to Hamich and then secure the town itself. The Second and Third Battalions would then sweep through Hamich and move on to seize Hill 232. However, as is often the case in war, the attack did not go as planned. 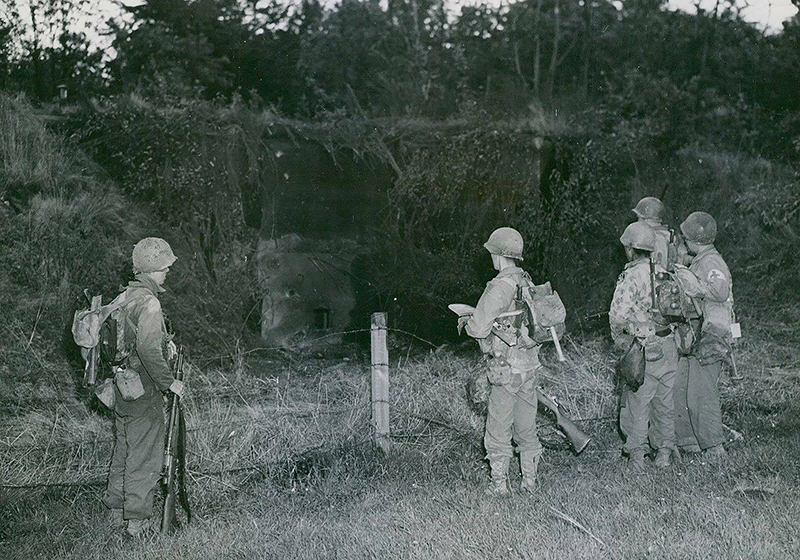 Men of L Company, 16th Infantry observe a knocked out German strongpoint somewhere in the Hürtgen Forest. The attack began on at 1245 hours on the 16th of November 1944. A Company jumped off alongside C Company with B Company following the two attacking companies in reserve. It quickly became clear to the GIs that this attack was not going to go according to plan as the enemy responded to the advancing waves of infantrymen. According to the official C Company history, the attack was met by “overwhelming artillery, mortar, tank and automatic fire.” Shortly after the First Battalion jumped off, the attack became pinned down and the advance came to a sudden stop. The forward companies were under accurate artillery fire as well as direct fire from Hill 232. Shells ripped through the tree tops in the thick forest, shattering the trunks and raining deadly shell splinters down upon the attacking infantry. Under this withering bombardment, the attack melted away and the commanding officers of the First Battalion could not re-establish order whilst under such heavy fire. 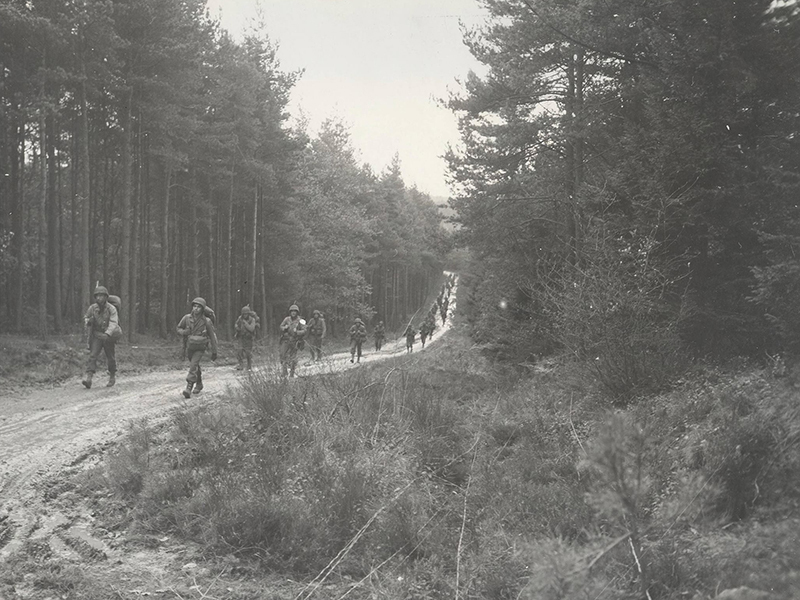 The Forward Observer (FO), who was attached to First Battalion for the attack, reported back to regiment at 1351 hours, stating that the assault companies had only advanced 500 yards from the jumping-off point and were pinned down. Major Rawie, FO for the 7th Field Artillery, was requesting counter-battery fire at 1407 hours in order to try and suppress the German artillery fire. He reported to regiment that all casualties so far were a result of German artillery. Soldiers of F Company moving into position in the Hürtgen Forest near Hamich. By 1500 hours, the First Battalion had finally reached its objective, the wooded outskirts of Hamich. Then, German infantry suddenly launched a counter-attack against C Company. Small arms fire and grenades began ripping through the forest as the Americans desperately tried to hold their hard won gains. The attack was gradually pushed back after American artillery began firing on the attacking German troops. The attack on Hamich was becoming confused after the heavy bombardment had knocked out communications to Battalion and Regimental headquarters (HQ). Even the attacking companies were becoming disorientated under such heavy fire. The third platoon of B Company stumbled into a large German patrol whilst advancing in reserve. Both sides immediately opened fire at near point-blank range. The savage firefight ended with the entire German patrol lying dead in the woods, with the Americans suffering one man killed in action. The first platoon from B Company did manage to fight their way into a couple of outlying buildings in Hamich, but were quickly forced back by a German assault. They then retired back to the wooded area surrounding Hamich to re-join the company for the night. Due to poor communication with the rear, this incident caused Regimental HQ to believe that the town had been taken before it was reported that no companies were in town by 1715 hours once a message had reached the rear. After the attack had stalled, German forces began furiously counter-attacking against the depleted First Battalion. This resulted in the original plan being scrapped and Third Battalion being moved forward to support the First Battalions’ left flank. The men of the Third Battalion soon came under artillery fire as they moved into position. Frank Smith from the weapons platoon of I Company recalls moving up through the forest when the halftrack leading their company was knocked out by a German tank in Hamich and the effects it had on the men around him. “I was lying across the feet of another soldier who burst into tears with loud sobs,” he remembers. “A lieutenant who was tangled with me called out for the man to shut up. It didn’t have any effect.” The bombardment caused the supporting heavy weapon platoon from M Company to pull back after their platoon leader was killed by shellfire. Frank recalls how delighted they looked to be on their way back out of danger. At 17:45 hours, the order was given to “button up and take the town tomorrow.” The attack had failed. At 1935 hours, it was reported that the Cannon Company FO, Captain Thomas F. O’Brian of Lincoln, New Hampshire, was killed in action during the German bombardment. O’Brien had been awarded two Distinguished Service Crosses for previous actions with the 16th Infantry Regiment, including one awarded for his actions on D-Day. The First Battalion also suffered many casualties; significantly higher numbers than had been anticipated. It was therefore decided that the First and Third Battalions would now have to take the town of Hamich and the Second Battalion would take Hill 232 alone. 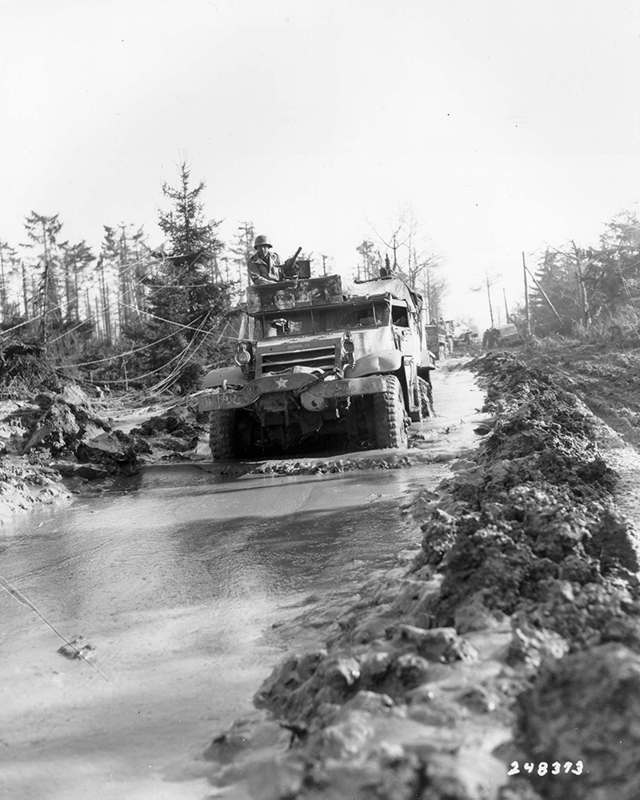 A U.S. half-track of the 16th Infantry moving through a muddy road in the Hürtgen Forest. During the night and early hours of Friday the 17th of November, the men of the badly shot up First Battalion and reinforcing Third Battalion were under constant harassing bombardment by German artillery as well as a number of counter-attacks made by German units to try and dislodge the GIs from their positions. Frank Smith, I Company, recalls one particularly harrowing experience during the night after listening to a wounded GI. “He was intermittently coughing and continued to cough all through the night hours.” The wounded man had lost both legs and suffered a terrible chest wound, shortly before daybreak he stopped crying and was found dead by Frank shortly after. B Company also managed to fight off an attack on their front, one man was killed in this action and two more were captured. The company was then severely depleted after a heavy concentration of German artillery fire and tree bursts. Many of the wounded had to crawl back to safety due to there not being enough litter bearers to carry all the wounded back. These constant attacks kept constant pressure on the men of the 16th Infantry to hold their positions and delayed any further assaults on Hamich itself. Just before 1350 hours, the attack was to begin anew. The men of First Battalion pushed off with the intention of hitting Hamich from the west and linking up with the Third Battalion units attacking northwards. The attack was supposed to be supported by Sherman tanks of A Company, 745th Tank Battalion, along with several tank destroyers from the 634th Tank Destroyer Battalion, but they were unable to reach Hamich due to poor roads and mines. The attack was soon running into problems and the men were described in the Regimental Journal as “taking a terrific pounding.” Some platoons of A Company had reached the outskirts of Hamich by 1405 hours and reported about five German tanks roaming through the town. The First and Third Battalions were unable to make any further progress into Hamich. At 1530 hours, C Company’s commander, Captain Briggs, was killed during a German counter-attack. Lieutenant Lycas took over command of the company. The attacking companies were facing such heavy fire coming from Hill 232, that the attack was halted. C Company was reported to be in a very bad way. At 1725 hours, C Company was attacked again by enemy infantry, with heavy small arms fire pinning them down. After fending off the attack, the First Battalion companies buttoned down for the night. The onslaught would continue the next day.